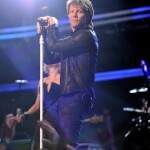 For his first Grammy performance ever, rock legend Jon Bon Jovi took to the stage wearing jeans by Rock & Republic. He performed a duet with Jennifer Nettles of Sugarland wearing Rock & Republic’s Slim [email protected]#! Coated Low-Rise Skinny Leg Jeans in Angst Black. These will be available soon on Rock & Republic’s website for $218.